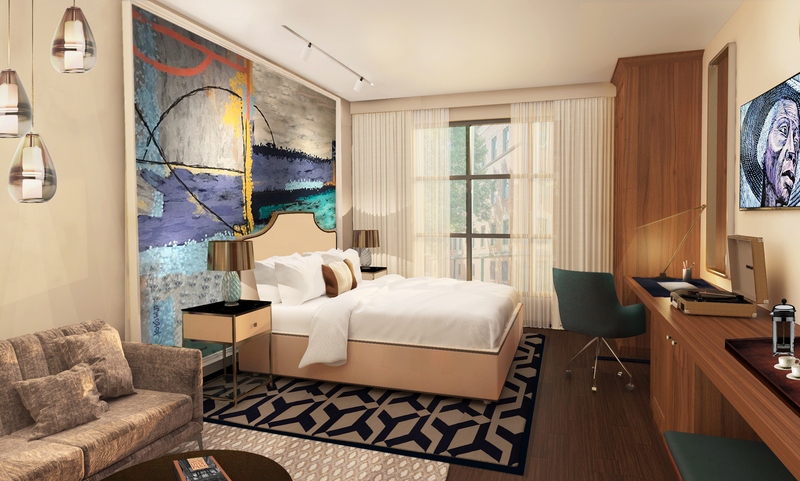 When the new SOPHY Hyde Park hotel opens next month in Chicago, it will offer Deluxe Kings and Deluxe Double Queen Rooms, but will also have three catagroies of suites available. Thoughtful and inspired, Novel Suites are designed with state-of-the-art amenities and features to provide guests with an intimate South Side city escape. Each of the Novel Suites features hardwood flooring throughout, living/dining space that offers a table to seat four, stocked pay mini bar and snack drawer, sectional couch with full-size sleeper sofa, coffee table, lounge chair, and 55-inch flat screen TV. The private king bedroom is furnished with 55-inch flat screen TV, full-sized wardrobe, workstation, blackout drapes, luggage bench, and lounge chair. The generously sized marble tiled bathroom offers a large walk-in shower, double vanity, and luxury bath products. An accessible Novel Suite is also available. The Dorchester Suites are ambitious and intellectually charged, embodying the craft and passion that inspires today’s Hyde Park. Each of the Dorchester Suites offers hardwood flooring throughout, open entry space with marble-counter sink, stocked pay mini bar and snack drawer, and living/dining space furnished with a dining table to accommodate 6. A sectional couch with twin size sleeper sofa, coffee table, lounge chair and 55-inch flat screen TV are also featured. The private king bedroom is complete with a 55-inch flat screen TV, blackout drapes, luggage bench and lounge chair. The bedroom offers a 90 square foot private dressing room equipped with two full-sized wardrobes and makeup vanity. The 146 square foot marble tiled bathroom includes a deep soaking tub, large walk-in shower, double vanity, and luxury bath products. An accessible Dorchester Suite is also available. Sophisticate and eclectic, the Opus Suites allow the curious visitor to delight in discoveries at every turn. Each of the Opus Suites offers hardwood flooring throughout and entryway with coat closet. A large kitchen space is equipped with a four-burner stove top, microwave, refrigerated drawers, flatware, dishware, glassware, stocked pay mini bar and snack drawer, as well as a large island with seating for four. The living space presents a wraparound sofa, 55-inch flat screen TV, coffee table, and ottoman. The dining area allows for thought-provoking conversation with seating for eight, ideal for small business meetings. The private king bedroom is furnished with blackout drapes, a 55-inch flat screen TV, chaise lounge, and walk-in closet. The marble tiled bathroom offers a deep soaking tub, large walk-in shower, double vanity, and luxury bath products.